This is the shocking moment a 33-ton glass shark tank at the Shanghai Orient shopping centre in China suddenly burst leaving 15 people injured by flying shards of broken glass and a torrent of water. The tank was an attraction at the entrance to the Shanghai Orient shopping centre in China’s second city when it shattered without warning on December 19. Shoppers fled in panic as shards of 15 cm thick acrylic glass gave way, flooding the entrance of the shopping centre. 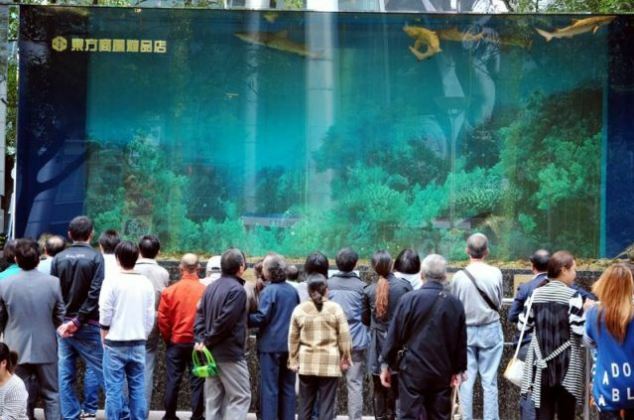 Chen Yongping, an official with the shopping centre management, said that they are not going to “build an aquarium again in the future”.